Fox is in a bit of an odd position with their X-Men franchise. On the one hand, you have Apocalypse, which was a colossal disappointment and left a lot of people feeling tired of the once beloved heroes. But then exciting projects like New Mutants and X-Force began to pop up, not to mention spinoffs like Logan and Deadpool finding tremendous success both with fans and at the box office, while on television we have the brilliant Legion and the upcoming family drama The Gifted. At this point, it’s really everything but the main saga that everyone’s looking forward to, as Apocalypse left such a sour taste in our mouths that we’re more eager to see all these spinoffs and new television ventures than we are a sequel to Bryan Singer’s 2016 bomb. That hasn’t stopped the studio from pushing forward though and 2018 will bring with it X-Men: Dark Phoenix. Adapting the mega popular comic book arc of the same time, casting is now underway and while we’ve heard that familiar faces like Jennifer Lawrence and Michael Fassbender will likely be back, along with James McAvoy, we’re now starting to learn about some new additions. Earlier today, Jeff Sneider of Meet the Movie Press revealed that the studio was targeting Angelina Jolie for a role. As expected, the fanboys had a field day with that, listing all the reasons why she’d be terrible for the franchise and expressing their outrage. 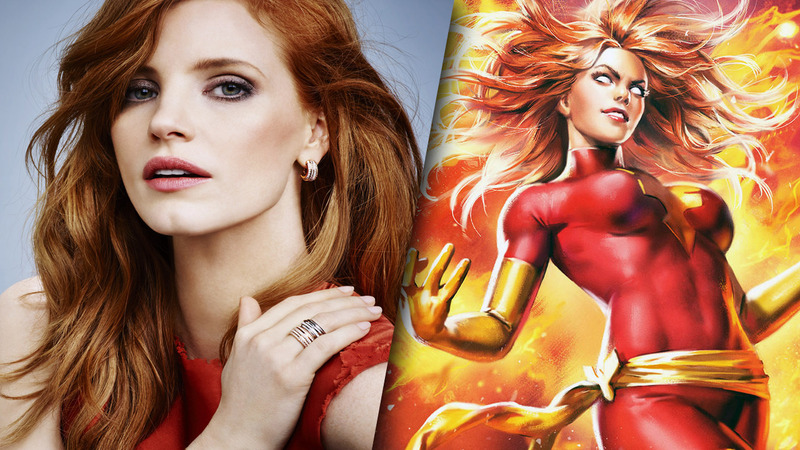 Fox has yet to comment on the whole thing, but there may be no reason to worry, as now Sneider say that the Wanted actress probably isn’t going to take the role and instead, the studio may bring in Jessica Chastain. While Sneider doesn’t specifically name Chastain, his Disappearance of Eleanor Rigby reference at the end of the Tweet tells us all we need to know (the actress starred alongside James McAvoy in that film). Again, no comment from Fox at this time, but from what we understand, Chastain would play the role that they wanted Jolie for, that of Empress of the Shi’ar. For those unfamiliar, the intergalactic Imperium is a vast collective of alien species who become key players in the comic’s iconic “Dark Phoenix Saga” arc. The character is renowned as Professor Xavier’s most serious relationship, and given that she’s in command of a galactic space fleet, Moira MacTaggert had better watch her back. We’ll continue to bring you any further updates on this casting situation as and when they arise, but until then, tell us, who would you rather have in X-Men: Dark Phoenix? Angelina Jolie or Jessica Chastain?